Economics professor Rob Fairlie tells U.S. Senators that barriers to financing is hurting the development and growth of minority-owned small businesses. UC Santa Cruz economics professor Rob Fairlie told a U.S. Senate committee Thursday that significant financial barriers are keeping minority businesses from opening and expanding even in a recovering economy. A gap in net wealth, relatively low levels of home ownership and bank use, and restrictions on borrowing are keeping prospective minority business owners from the capital they need, Fairlie told the Senate Committee on Small Business and Entrepreneurship. Fairlie was the lead witness to testify at the hearing "Closing the Gap: Exploring Minority Access to Capital and Contracting Opportunities." Committee Chair Sen. Mary Landrieu, D- La, asked Fairlie, an expert on minority entrepreneurship, to "lay the data out" based on his research. Also testifying was the deputy administrator of the Small Business Administration, president of the National Urban League, and representatives of the U.S. Pan Asian American Chamber of Commerce, National Bankers Association, and U.S. Hispanic Chamber of Commerce. Fairlie told the committee that minority-owned businesses are being hit especially hard in the current economy due to fewer resources and the size of their business. His research shows the average minority-owned business has revenue of $178,000 per year, less than 40 percent of the level for non-minority businesses. Recent data show that less than half of African Americans and Latinos own their own homes compared with more than 75 percent of whites, Fairlie said. This is important because small business owners often turn to home equity for either start up or operating capital. In the realm of bank use, Fairlie said a new study by the U.S. Census Bureau and the Federal Deposit Insurance Corporation (FDIC) shows that 20 percent of African Americans and Latino do not have a bank or credit union account compared with only 3 percent of whites or Asian Americans. Minority-owned businesses account for $1 trillion in sales each year, employ six million people and also create another six million jobs for the owners, Fairlie said. They provide $168 billion in payroll. But, despite those numbers, the barriers to financing "limits U.S. productivity, job creation, and innovation, which are essential to getting the U.S. economy back on track." Most disturbing was a growing inequality in wealth, Fairlie said. Though the numbers are old – from 2004 – they show the average wealth gap between minority and white families is $100,000, up from $48,000 in an earlier period. 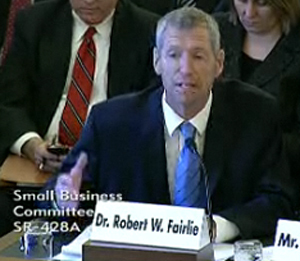 Fairlie testified before the same committee last April. His current testimony is available at the committee's web site. It begins at about 76 minutes into the hearing.